Well, since our mods cannot yet enact their awesome plans to reorganize the forum and add a social subforum, come over here for chatter and silliness. I think maybe this is more useful for in between games or people not in current games than it is during one? nanooktheeskimo wrote: I think maybe this is more useful for in between games or people not in current games than it is during one? Probably yes, but now it's here for after the current game and before the next one! 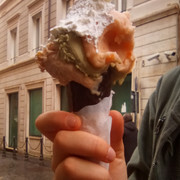 Would this be an appropriate place for me to brag about an awesome gelato I got in Rome? IIRC it was whiskey, some exotic orange sorbet, and pistachio (I just chose the weirdest flavours). And yeah, glad I subbed out of Internal Affairs because I would not have had time for Mafia there. Even somewhere like London or Berlin, maybe, but not Rome. What an unbelievable place! My new favorite city. shadowface wrote: IIRC it was whiskey, some exotic orange sorbet, and pistachio (I just chose the weirdest flavours). And yes. Perfect place for it.